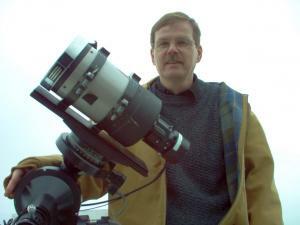 BREVARD – On Sept. 29, Dr. Michael Castelaz, associate professor of physics and astronomy at Brevard College, will give a talk on the Milky Way Galaxy. The presentation, “200 Billion Stars,” will be held on campus in McLarty-Goodson Room 125 at 7:00 p.m. Immediately preceding the event, there will be a dinner at 6 p.m. in the Institute Room in Myers Dining Hall. The dinner requires a reservation and costs $8. Contact Jeff Llewellyn for your dinner reservation, 828-884-8027 or llewellyn@brevard.edu. The talk is free of charge. The public is invited and encouraged to attend both the dinner and talk. The talk will be targeted at the general public and members of Sigma Xi, a nonprofit scientific research society with more than 80,000 members in the science and engineering fields. Dr. Castelaz, will be discussing how scientists can develop a complete model of what our galaxy looks like using modern star surveys combined with infrared and radio observations designed to map the gas and dust structure of the galaxy. Castelaz will also address binary stars in our galaxy. Contact binary stars are two stars, each much like our sun, orbiting each other in about a day. He seeks to answer this question and more during his presentation.